It’s the texture, not the taste, that will give you pause with this bread. Hot from the oven, when you break these small golden brown puffs open you’ll find a stretchy filling that is more tender than chewy and packed with cheesy goodness. What, you might ask yourself, is this? It’s bread made from yuca flour. This, in turn, raises another question. What is yuca? Whether you refer to it as yuca, cassava, or manioc, this gnarly root vegetable is native to South America and a popular staple there as well as in Africa. Yuca, which can grow up to 15-inches long, and resembles a long sweet potato in shape, comes in two main varieties: sweet and bitter. Both varieties have a hard brown skin that encloses a white, bland-tasting flesh; both also contain a poisonous compound which requires yuca to be cooked before eating (never consume yuca raw). Yuca flour, which is found in most Latin American markets and select natural food stores, has a silky texture and an appearance and feel similar to cornstarch. When combined with liquid, it quickly congeals to form a starchy dough. 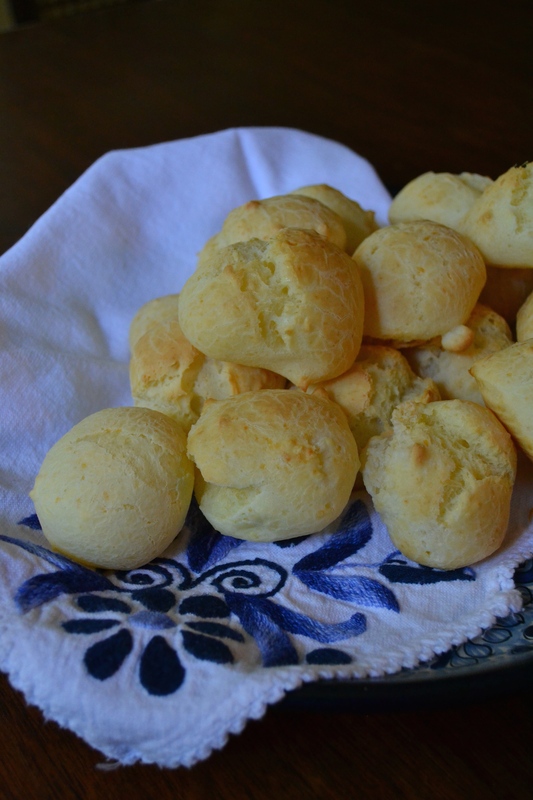 While the properties of yuca make it difficult to work with, the results are worth the trouble especially if making pão de queijo mineiro. 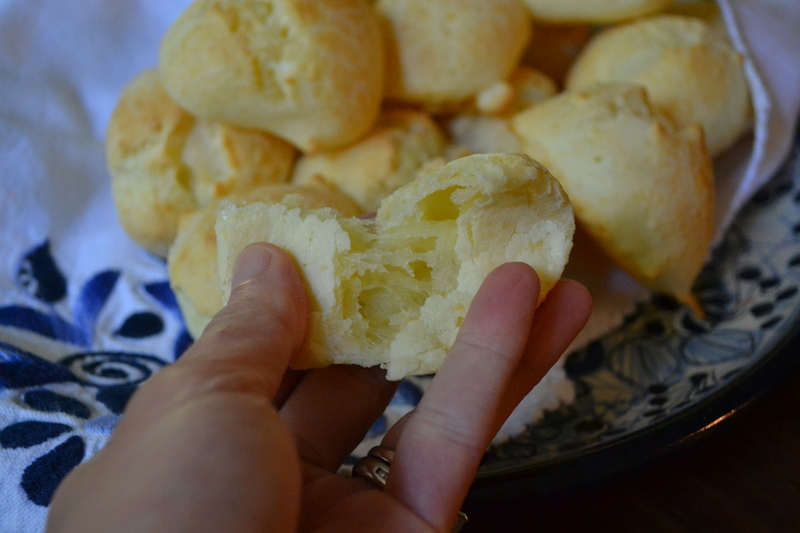 It’s hard to describe pão de queijo, the Brazilian specialty popular in the Minais Gerais state. 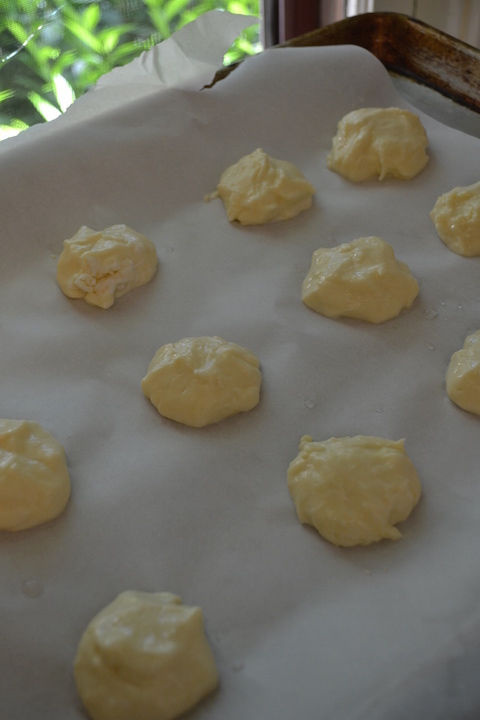 In many ways, their outer appearance and the way they puff upon cooking reminds me of French gougeres. The texture is certainly similar, although more dense and not as airy. A bite brings to mind the elasticity and pull of a baguette straight from the oven, although in what will surely delight the gluten-free among us, there is no gluten. In terms of ingredients, these rolls are pretty straightforward provided you can find the yuca flour. The challenge is in making the dough and then shaping it. In testing this recipe, I actually made these rolls three times. The first time I made them by hand, the second time using a food processor, and the third time using a stand mixer. The first time, when I made the rolls by hand, I tired of working the eggs into the stiff dough and didn’t mix it enough. 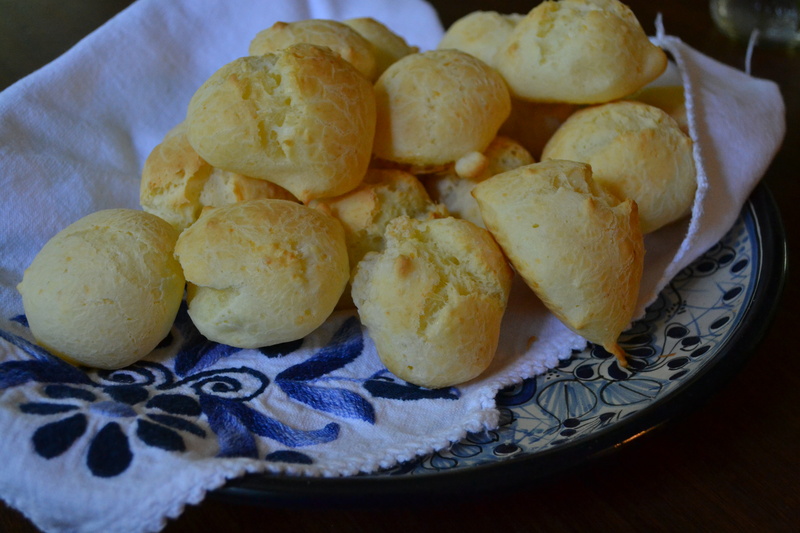 The resulting pão de quiejos were delicious, but decidedly lacking in the looks department. In the second attempt, the food processor worked quickly and well, but I actually had the opposite problem from making them by hand in that I over-mixed the dough as I couldn’t see the dough through the plastic container. Once again the results were yummy, but dense and lumpy due to over-mixing. The third time was the charm. 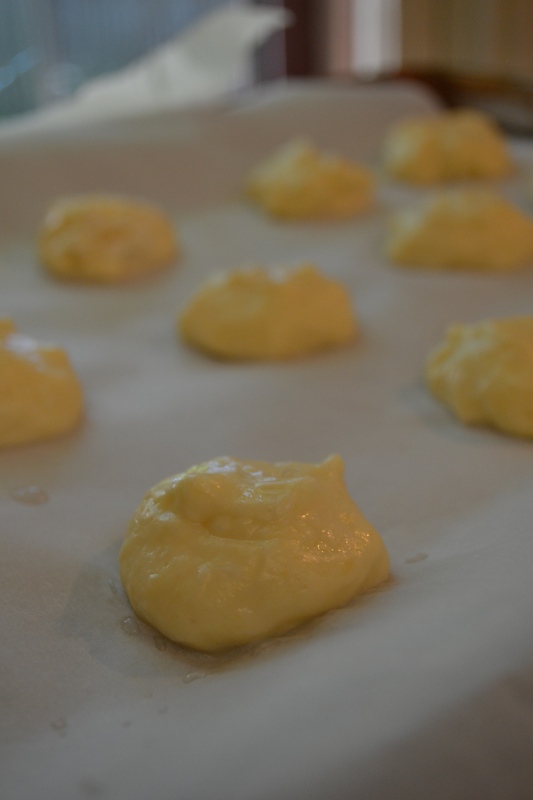 The electric stand mixer had the strength to work the eggs into the stiff dough quickly and good visibility of the dough to prevent over-mixing. The resulting rolls had a beautiful outside appearance and a bite that lacked the density of the first two attempts. Shaping the rolls requires a bit of patience and plenty of water. Be sure to dampen your hands before starting to work with the dough as dry hands will yield a sticky mess and more frustration than bread. If things are looking a bit grim the first time around (i.e. lumpy balls and dough covered fingers) continue to press on. Every single one of my attempts yielded a bread that was not just edible, but also delicious, showing that yuca flour for all its challenges is pretty forgiving to the home cook. Happy cooking! The toughest part of this process is shaping the rolls as the dough is sticky and damp. While it might seem counterintuitive to add water, keeping your hands wet while working with the dough makes shaping much easier. Preheat the oven to 450 degrees and place a rack in the top third and bottom third of the oven. Line two baking sheets with parchment paper. Combine the yucca flour and baking powder in the bowl of an electric mixer fitted with a paddle attachment and stir to combine. Combine the milk, butter, and salt in a small saucepan. Bring to a boil and cook, stirring until the butter melts. 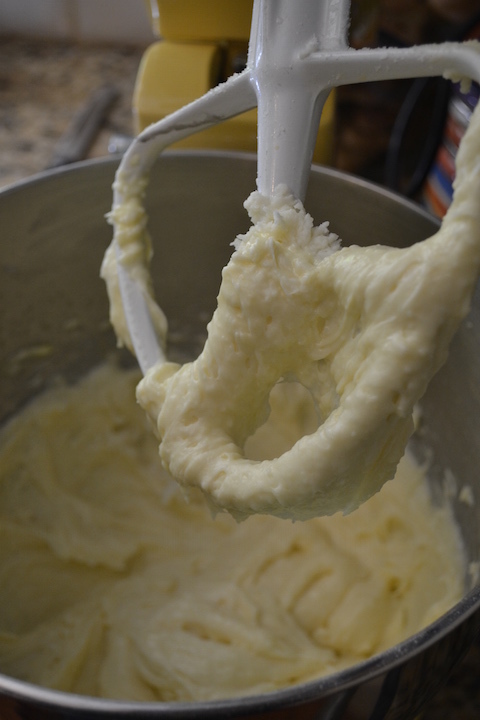 With the mixer on low, pour the milk mixture over the yuca flour and mix, increasing the speed to medium, until dough has formed a ball around the paddle. Beat until the yuca flour has been completely incorporated, but no longer. With the mixer on slow, add the egg and parmesan. Increase the speed to medium and beat until just combined. The dough will be shiny and have a sticky, rope-like appearance. Fill a small bowl with water. Dampen your hands and working with a golf-ball size amount of dough shape it into a round. The dough is not easy to work with, but can be shaped provided your hands are very wet. Place the round on a baking sheet and repeat until you have about 20 dough balls. Reduce the oven temperature to 375 degrees and place the baking sheets on the top and bottom racks. Bake for 25 minutes until golden brown. Rotate baking sheets halfway through cooking. To prepare in advance, parcook rolls for 15 minutes. Cool and then freeze. When ready to serve, preheat the oven to 375 degrees. Bake the rolls from frozen for 15 minutes. Serve immediately. Oooh I’ve never tried Yuka flour but this really makes me want to.